Robert Climie Cree was born in Scotland. His parents died during WW1 and Bob was raised by an aunt until he finished school in 1929. He emigrated to Canada about 1930 or 1931 and worked at a variety of jobs in and around Thamesford. He was apprenticed to a tool and die maker for two years, farmed for four years and worked for a service station in Thamesford for four and a half years. While he was employed at the service station, he also drove a milk route. From 1939 to 1941, he was a member of the local militia unit, the Oxford Rifles. Bob was enrolled in the Canadian Active Service Force at Woodstock on April 5, 1942. Assigned to the Infantry, he was promoted acting sergeant the following day in recognition of his former service with the Oxford Rifles. During the following year, Sergeant Cree qualified as an instructor, as well as driver for both wheel and track vehicles. On April 15, 1943, he was posted to Headquarters 11 Military District in Vancouver as a reinforcement. On July 17, 1943 he was promoted Provisional Second Lieutenant and posted to A16 Canadian Infantry Training Centre at Calgary where he was promoted to Provisional Lieutenant August 21, 1943. On November 16, 1943, Lieutenant Cree was transferred to the Refresher Wing at 01 Officers Training Centre at Brockville where he took his final training before sailing to England on February 13, 1944. On arrival in England, he joined 1st Canadian Infantry Reinforcement Unit where he took a variety of courses including Battle Drill. 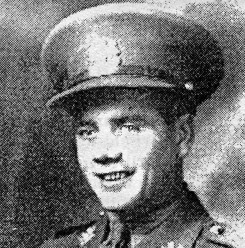 On August, 1944, he arrived in France and on August 22, 1944 was posted to the South Saskatchewan Regiment then serving in the 6th Infantry Brigade with the 2nd Canadian Division. By August 22, 1944, the German 7th Army had been defeated and was surrounded by the Allied Armies in the Falaise Pocket. The last escape route had been closed August 20, 1944 and surviving elements of the German Armies were desperately withdrawing to the east. Starting at Orbec on August 22 the 2nd Canadian Division pursued the fleeing Germans as far as Belgium and western Holland. In this pursuit, the Canadian advance was held up only by the German rear guards who held temporary positions only long enough to check the advance and inflict casualties. During these operations between Rouen and the Forest of La Londe on August 28,1944, Lieutenant Cree was killed, probably by small arms fire. Initially he was reported as missing in action but subsequent casualty lists corrected this to reflect the fact that he had been killed in action. Lieutenant Cree is buried in the Bretteville-sur-Laize Canadian War Cemetery in France. He was survived by his wife, Mabel Judge, daughter Betty Anne and son Robert, all of Thamesford.-- Courtesy of St. Marys Journal Argus.